Despite being one of most difficult exercises to perform, pullups are also one of most effective exercises at building back and upper strength. Practicing pullups with other closed-chain exercises such as negative pullups, can help build strength in your upper body and increase grip strength, enabling you to perform more pullups. Pullups are a compound exercise in which multiple muscles and joints are used in the execution of the movement. The primary muscle targeted is the latissimus dorsi muscle in the back. However, pullups also require the use of many additional secondary muscles to assist the latissimus dorsi in the movement such as brachialis, brachioradialis, biceps brachii, teres major, rhomboids, levator scapulae, trapezius and pectoralis major and minor. 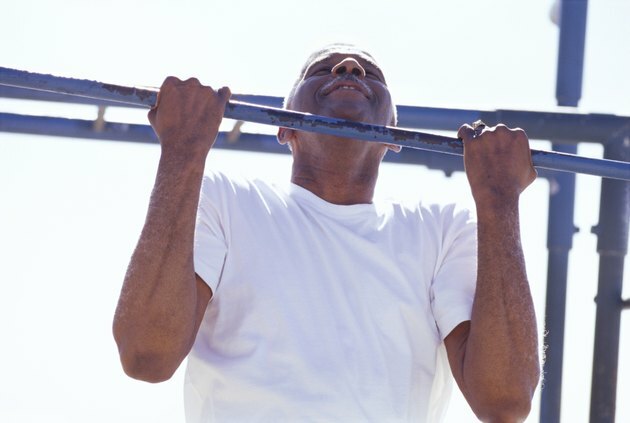 Pullups are a closed-chain exercise in which the hands remain in a fixed position throughout the movement. Closed-chain exercises require the body to use more stabilizing muscles than in open-chain exercises to execute the movement. Open-chain exercises allow the hands or feet to move about through space during the movement such as in the lat pulldown, bench press or leg extension. Because the body requires more stabilizing muscles in the back and throughout the core to perform a pullup, the most effective way to improve pullups is by performing pullups or completing close-chain exercises similar to pullups. Negative pullups are similar to a flexed arm hang. A flexed arm hang is when you hold your body in the up position of the pullup with your chin above the bar for as long as possible. Negative pullups begin in the flexed arm hang position and then slowly, with control, lowering down to the hanging position. A training partner or a step stool may be required to help get to the up starting position. Negative pullups are a closed-chain exercise ideal for building strength in the upper body because they use the same muscles and improve grip strength needed in the pullup. Furthermore, negative pullups work with gravity instead of against gravity and allow you to lift about 20 percent more weight than you would be able to lift, notes ExRx.net. In other words, negative pullups take about 20 percent of your body weight away during the downward motion, compared to the upward motion. Include negative pullups at the end of your regular sets of pullups or by performing six to eight repetitions of negative pullups to help improve pullups.